I thought to write about generosity; it's been a common topic around here and it's always a favorite topic of mine, as it goes hand in hand with the thought of missions and sending and supporting here, near, and far away. HA! I guess I DID just write about it... but it's not my main point. 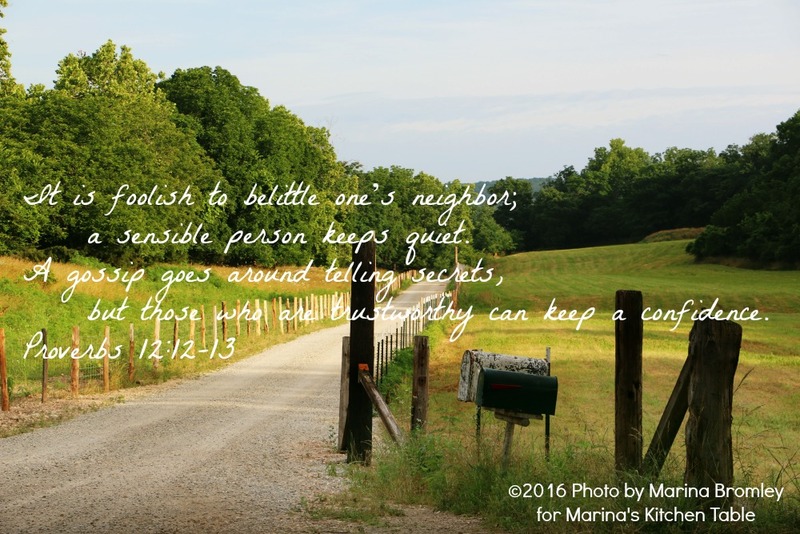 My heart (again) is pulled towards being a good neighbor. It's a common topic in these Proverbs, and so I think it must have ALWAYS been important in society. I'm always curious how new neighbors respond to us moving into the neighborhood. Sometimes they don't say a thing! In one neighborhood, it took nearly 8 months before they introduced themselves! They had little to say about the neighborhood or life in that city, and we pretty much only spoke with them a few times in the year we lived there, even though our driveways were next to each other and their kids played on the basketball goal often at the same time my grandkids did ours. It was awkward! Another time one of the neighbors came out and told me who was who on our whole street... who was married/divorced/single, who had kids, what everyone did for a living. It was ok to get a mini rundown, but she got pretty personal, and it turned out to be pretty much a lot of gossip. It made it hard to meet these people for myself, and get to meet them on my own, having her pre-determined descriptions sitting in the back of my head. Thankfully, it was one of the most friendly neighborhoods ever, and it was easy to get over her notions. Perhaps because I've been the new neighbor so much, I know the type of neighbor I hope others want to live next to. I don't want to be gossipy but want to give an honest complimentary description about the neighborhood. I want each of my neighbors to shine! I love where we live now, and as we get to know our new neighbors, I hope I can do all of my neighbors justice. We don't have to all be best friends, but I pray we can be neighborly - in the best ways! !